This article is about the book written by Tocqueville. For the actual system of government of the United States, see Politics of the United States. De La Démocratie en Amérique (French pronunciation: ​[dəla demɔkʁasi ɑ̃n‿ameˈʁik]; published in two volumes, the first in 1835 and the second in 1840) is a classic French text by Alexis de Tocqueville. Its title translates as On Democracy in America, but English translations are usually simply entitled Democracy in America. In the book, Tocqueville examines the democratic revolution that he believed had been occurring over the previous several hundred years. In 1831, Alexis de Tocqueville and Gustave de Beaumont were sent by the French government to study the American prison system. In his later letters Tocqueville indicates that he and Beaumont used their official business as a pretext to study American society instead. They arrived in New York City in May of that year and spent nine months traveling the United States, studying the prisons, and collecting information on American society, including its religious, political, and economic character. The two also briefly visited Canada, spending a few days in the summer of 1831 in what was then Lower Canada (modern-day Quebec) and Upper Canada (modern-day Ontario). After they returned to France in February 1832, Tocqueville and Beaumont submitted their report, Du système pénitentiaire aux États-Unis et de son application en France, in 1833. When the first edition was published, Beaumont was working on another book, Marie, ou, L'esclavage aux Etats-Unis (two volumes, 1835), a social critique and novel describing the separation of races in a moral society and the conditions of slaves in the United States. 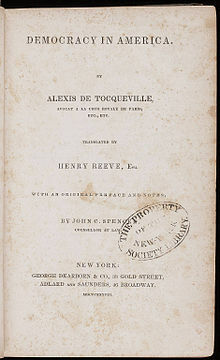 Before finishing Democracy in America, Tocqueville believed that Beaumont's study of the United States would prove more comprehensive and penetrating. He begins his book by describing the change in social conditions taking place. He observed that over the previous seven hundred years the social and economic conditions of men had become more equal. The aristocracy, Tocqueville believed, was gradually disappearing as the modern world experienced the beneficial effects of equality. Tocqueville traced the development of equality to a number of factors, such as granting all men permission to enter the clergy, widespread economic opportunity resulting from the growth of trade and commerce, the royal sale of titles of nobility as a monarchical fundraising tool, and the abolition of primogeniture. Tocqueville described this revolution as a "providential fact" of an "irresistible revolution," leading some to criticize the determinism found in the book. However, based on Tocqueville's correspondences with friends and colleagues, Marvin Zetterbaum, Professor Emeritus at University of California Davis, concludes that the Frenchman never accepted democracy as determined or inevitable. He did, however, consider equality more just and therefore found himself among its partisans. [I]nstruct democracy, if possible to reanimate its beliefs, to purify its motives, to regulate its movements, to substitute little by little the science of affairs for its inexperience, and knowledge of its true instincts for its blind instincts; to adapt its government to time and place; to modify it according to circumstances and men: such is the first duty imposed on those who direct society in our day. The remainder of the book can be interpreted as an attempt to accomplish this goal, thereby giving advice to those people who would experience this change in social states. Tocqueville begins his study of the U.S. by explaining the contribution of the Puritans. According to him, the Puritans established the U.S. democratic social state of equality. They arrived equals in education and were all middle class. In addition, Tocqueville observes that they contributed a synthesis of religion and political liberty in America that was uncommon in Europe, particularly in France. He calls the Puritan Founding the "seed" of his entire work. Tocqueville was one of the first social critics to examine the situation of U.S. women and to identify the concept of Separate Spheres. The section Influence of Democracy on Manners Properly So Called of the second volume is devoted to his observations of women's status in U.S. society. He writes: "In no country has such constant care been taken as in America to trace two clearly distinct lines of action for the two sexes and to make them keep pace one with the other, but in two pathways that are always different." He argues that the collapse of aristocracy lessened the patriarchal rule in the family where fathers would control daughters' marriages, meaning that women had the option of remaining unmarried and retaining a higher degree of independence. Married women, by contrast, lost all independence "in the bonds of matrimony" as "in America paternal discipline [by the woman's father] is very relaxed and the conjugal tie very strict". As for myself, I do not hesitate to avow that although the women of the United States are confined within the narrow circle of domestic life, and their situation is in some respects one of extreme dependence, I have nowhere seen women occupying a loftier position; and if I were asked, ... to what the singular prosperity and growing strength of that people ought mainly to be attributed, I should reply,—to the superiority of their women. Insightful analysis of political society was supplemented in the second volume by description of civil society as a sphere of private and civilian affairs mirroring Hegel. Tocqueville observed that social mechanisms have paradoxes, as in what later became known as the Tocqueville effect: "social frustration increases as social conditions improve". He wrote that this growing hatred of social privilege, as social conditions improve, leads to the state concentrating more power to itself. Tocqueville's views on the United States took a darker turn after 1840, however, as made evident in Aurelian Craiutu's Tocqueville on America after 1840: Letters and Other Writings. Democracy in America was published in two volumes, the first in 1835 and the other in 1840. It was immediately popular in both Europe and the United States, while also having a profound impact on the French population. By the twentieth century, it had become a classic work of political science, social science, and history. It is a commonly assigned reading for undergraduates of American universities majoring in the political or social sciences, and part of the introductory political theory syllabus at Cambridge, Oxford, Princeton and other institutions. In the introduction to his translation of the book, Harvard Professor Harvey C. Mansfield calls it "at once the best book ever written on democracy and the best book ever written on America." Tocqueville's work is often acclaimed for making a number of astute predictions. He anticipates the potential acrimony over the abolition of slavery that would tear apart the United States and lead to the American Civil War as well as the eventual superpower rivalry between the United States and Russia, which exploded after World War II and spawned the Cold War. Noting the rise of the industrial sector in the American economy, Tocqueville, some scholars have argued, also correctly predicted that an industrial aristocracy would rise from the ownership of labor. He warned that '... friends of democracy must keep an anxious eye peeled in this direction at all times', observing that the route of industry was the gate by which a newfound wealthy class might potentially dominate, although he himself believed that an industrial aristocracy would differ from the formal aristocracy of the past. On the other hand, Tocqueville proved shortsighted in noting that a democracy's equality of conditions stifles literary development. In spending several chapters lamenting the state of the arts in America, he fails to envision the literary Renaissance that would shortly arrive in the form of such major writers as Edgar Allan Poe, Henry David Thoreau, Ralph Waldo Emerson, Herman Melville, Nathaniel Hawthorne and Walt Whitman. Equally, in dismissing the country's interest in science as limited to pedestrian applications for streamlining the production of material goods, he failed to imagine America's burgeoning appetite for pure scientific research and discovery. According to Tocqueville, democracy had some unfavorable consequences: the tyranny of the majority over thought, a preoccupation with material goods, and isolated individuals. This translation was completed by Reeve and later revised by Francis Bowen. In 1945, it was reissued in a modern edition by Alfred A. Knopf edited and with an extensive historical essay by Phillips Bradley. Bilingual edition based on the authoritative edition of the original French-language text. ^ Johri, Vikram. "'Alexis de Tocqueville': the first French critic of the US". The Christian Science Monitor. Retrieved 22 April 2011. ^ Tocqueville, Alexis de (2000). Democracy in America. The University of Chicago Press. Chicago. p. 13. ISBN 0-226-80532-8. ^ a b Tocqueville, Alexis de (2000). Democracy in America. Chicago: University of Chicago Press. ISBN 0-226-80532-8. ^ Zetterbaum, Marvin (1967). Tocqueville and the problem of democracy. Stanford: Stanford University Press. ^ Tocqueville, Alexis de (2000). Democracy in America. Chicago: University of Chicago Press. p. 7. ISBN 0-226-80532-8. ^ Tocqueville, Alexis de (1840). "Chapter XII: How the Americans understand the Equality of the sexes". Democracy in America. London: Saunders and Otley. p. 101. ^ Tocqueville, Alexis de (1840). "Chapter X: The young Woman in the Character of a Wife". Democracy in America. London: Saunders and Otley. pp. 79–81. ^ Tocqueville, Alexis de (1840). "Chapter XII: How the Americans understand the Equality of the sexes". Democracy in America. London: Saunders and Otley. p. 106. ^ Swedberg, Richard (2009). Tocqueville's Political Economy. Princeton University Press. p. 260. ISBN 9781400830084. ^ Tocqueville, Alexis de (2000). Democracy in America. Chicago: The University of Chicago Press. ISBN 0-226-80532-8. ^ "Tocqueville, Democracy in America, Note on the Translation". Press.uchicago.edu. Retrieved 2012-06-23. ^ "Democracy in America: Translator's Note – Arthur Goldhammer". Loa.org. Archived from the original on 2012-07-26. Retrieved 2012-06-23. ^ "Democracy in America De la Démocratie en Amérique". Libertyfund.org. Archived from the original on 2011-02-03. Retrieved 2012-06-23. Arnaud Coutant, Tocqueville et la Constitution démocratique, Paris, Mare et Martin, 2008. A. Coutant, Une Critique républicaine de la démocratie libérale, Paris, Mare et Martin, 2007. Laurence Guellec, Tocqueville : l'apprentissage de la liberté, Michalon, 1996.